For dedicated movie and sports nights the owners can draw the curtain to isolate the cinema room from the playroom. In here the request was for the biggest screen possible (150in) within the space, so in-wall speakers and acoustically transparent screen material were natural solutions. The Runco PJ suited the distance and brightness requirements. For much of the time, the AV setup is used to watch TV, so an outboard Lumagen processor was specified to deliver scaling and deinterlacing, with the Lumagen's different profiles letting Cyberhomes establish specific colour management for individual sources including Sky and Apple TV. 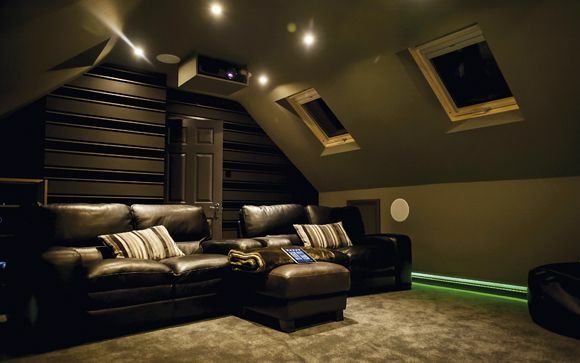 The cinema was fitted out at the same time that Cyberhomes was completing a massive automation/multiroom project across the rest of the house – including no fewer than 32 B&W in-ceiling speakers, seven Samsung flatscreens in various zones and luxury tricks such as motion-sensitive lighting. We'd probably still end up in here, though.